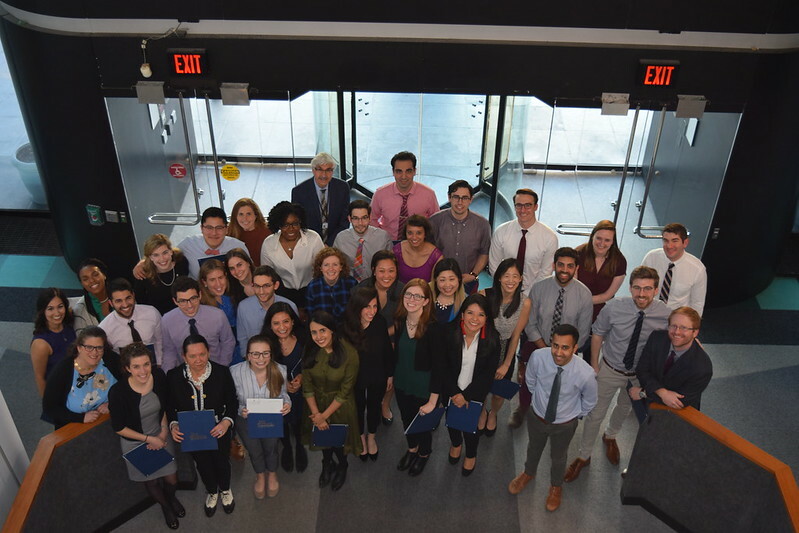 The New York Medical College (NYMC) School of Medicine (SOM) was proud to induct 33 members of the Class of 2020 into its chapter of the Gold Humanism Honor Society (GHHS), an initiative of the Arnold P. Gold Foundation, at a ceremony on April 1. Established in 2002 to foster, recognize and support the values of humanism and professionalism in medicine, GHHS honors senior medical students, residents, role-model physician teachers and others who have “demonstrated excellence in clinical care, leadership, compassion and dedication to service.” Membership to the society is through a peer nomination and selection process and promotes the ideals of humanism in medicine through community service, mentorship, role-modeling and other initiatives. The ceremony included opening remarks by Jennifer L. Koestler, M.D., senior associate dean for medical education and associate professor of pediatrics and medicine who serves as the GHHS faculty advisor, and an inspirational keynote address by Lidia Klepacz, M.D., assistant professor of psychiatry and behavioral sciences. Dr. Klepacz received a Leonard Tow Humanism in Medicine Award, along with Kevin Shayani, SOM Class of 2019. The awards recognize graduating students and faculty members who demonstrate both clinical excellence and outstanding compassion in the delivery of care and who show respect for patients, their families and health care colleagues. After receiving their GHHS pins and certificates, inductees took the GHHS oath to model, support and advocate for compassionate, patient-centered care throughout their careers.